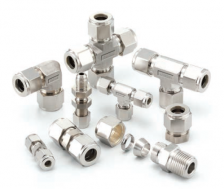 Tube Fittings have been designed specifically for the many demanding applications such as chemical,petroleum, power generating, pulp, paper and various types of manufacturing industries. They provide a highly reliable, leak proof and torque free seal on all tubing connections. Tube Fittings are commonly used on instrumentation, process and control systems, where high quality tube fittings are required. Easy to fit, minimal need for tools.